This is one I had not heard of before. But it took only a few minutes of Internet searching for me to confirm this story—and to start to gather its extraordinary details. Dorothea and Gladys Cromwell were twin sisters, born in Brooklyn in 1885. Educated at private schools in New York City, they then studied and traveled abroad. They were descendants of Oliver Cromwell and women of great wealth, each having inherited a fortune from their father, who served as a trustee of the Mutual Life Insurance Company of New York City. Gladys Cromwell, in happier days, driving a coach in New York City. American Red Cross workers at the canteen for Hospitals 6 and 7, Souilly, Meuse, France. Gladys Cromwell is second from left; her twin sister Dorothea is at far right. Courtesy of the Library of Congress. The Cromwell twins with French Army soldiers in Chalons, France. Dorothea is at left, pitcher in hand; Gladys is at right, holding a basket. For eight months they worked under fire on long day and night shifts; their free time was filled with volunteer outside service; they slept in “caves” or under trees in a field; they suffered from the exhaustion that is so acute to those who have never known physical labor; yet no one suspected until the end came that for many months they have believed their work a failure, and their efforts futile. . . . overwhelming strain and fatigue had made them more weary than they realized, and the horrors of conditions near the Front broke their already overtaxed endurance. The Cromwell twins became celebrities in France. And they were happy to continue their work there, even after the armistice of November 11, 1918 had ended combat. But their only brother, Seymour, urged them, with the war having ended, to come home, and they relented, boarding the SS La Lorraine on January 19, 1919, at Bordeaux Harbor, for the voyage back to their home in New York City. United States Army Private Jack Pemberton was on duty on the upper deck of the La Lorraine the night it started for America. As he huddled against a brisk wind and a cold mist, he saw two women, each wearing a black cape, walking arm-in-arm, talking. They then separated, and one of the women climbed atop the ship’s rail, then disappeared. The second woman followed, also climbing the rail and disappearing into the blackness. Pemberton heard two faint splashes below. He ran to the corporal in charge of sentries, who alerted the bridge, and the alarm was sounded. But it took 15 minutes, during which the ship traveled 5 miles, before the ship could be slowed. By that time the river channel was too narrow for the ship to turn around and search for bodies. 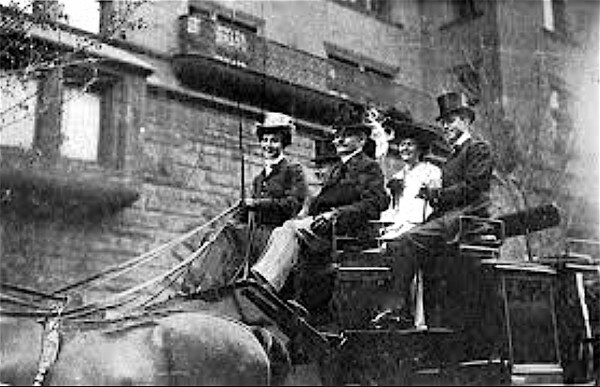 In New York, their brother, Seymour (who died in 1925 and is interred in section 70, lot 1792), who served as the president of the New York Stock Exchange, was unconvinced when word arrived of their deaths and the possibility that they had been suicides. He had received what he described as “a cheerful letter” from them just a week before they were to sail. Two days after the La Lorraine sailed, he had received a cable from the sisters stating that they had missed that ship and would be sailing soon on another ship. He had cabled French organizations for more information, but it had been slow in coming. When his inquiry to the shipping line was forwarded to the captain of the La Lorraine, the captain had cryptically cabled back that the sister’s baggage was in their state room, but they were not on board. But then came information that a note had been found in their stateroom, addressed to the head of their Red Cross unit, stating that they intended to “end it all.” Friends confirmed that both had complained of being tired, both physically and mentally. Many witnesses aboard the Lorraine reported that one of the sister had been extremely unhappy. According to a report in the Brooklyn Daily Eagle, four people on the Lorraine saw the sisters jump to their death. On January 26, The New York Times reported that the police commissioner of Bordeaux had confirmed that their deaths were by suicide. A memorial service was held at St. Bartholemew’s Church in Manhattan on February 5. 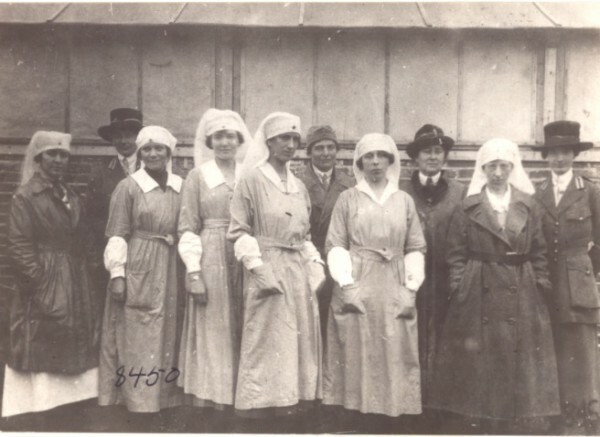 Many Red Cross nurses in uniform and prominent society people attended. These crosses mark the graves of Dorothea (at left) and Gladys Cromwell (at right) at Surennes American Cemetery. Lovely cenotaphs to their memory adorn the Cromwell lot at Green-Wood. 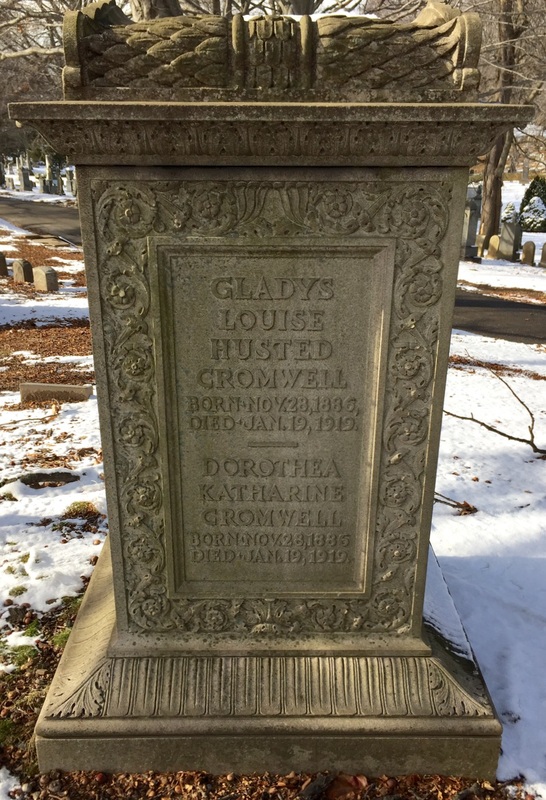 The cenotaph memorializing Gladys and Dorothea Cromwell at Green-Wood is an outstanding example of early 20th century carving. It is located on Forest Ridge, in section 70, lot 1792–one of Green-Wood’s earliest lots. This is a rare instance–perhaps unique–of a memorial to two individuals with the same dates of birth and death. 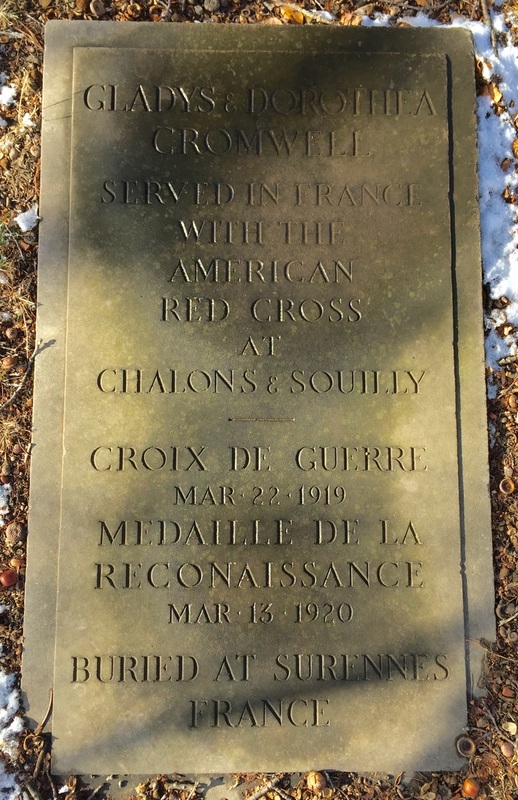 This stone, flush with the ground, outlines the story of Gladys and Dorothea Cromwell, including the Croix de Guerre and the Medaille de La Reconaissance that that they received, posthumously, for their service in France. 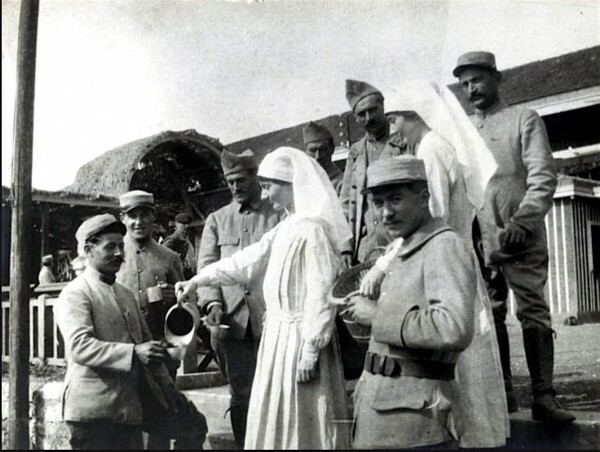 A year ago the soldiers in the Chalons section were speaking of herself and her sister (two beings indeed with a single soul) as “the Saints.” The government of France recognized their devotion and the worth of their service by the decoration it gave. These sisters were like twin spirits caught into an alien sphere, strangely beautiful and strangely apart, and the heavy and unimaginable weight of the world’s agony became too great for them to bear. In October, 1919, the Brooklyn Daily Eagle reported that each of the Cromwell sisters had left an estate of $661,748—the equivalent of just over $9 million in 2017 money. The United States entered in World War I in April, 1917. In commemoration, 100 years later, I will be leading a World War I trolley tour of Green-Wood on Saturday, April 22. We will visit the Cromwell sisters’ cenotaph on that tour, and tell their story. Dorothea Cromwell, Gladsy Cromwell, Seymour Cromwell. I will try to include them on upcoming tours. It is a fascinating story and wonderful memorials. Riveting that these twins gave so much, and lost everything. May God cradle their souls. Thank you for this poignant tale – shell shock affected so many at the time but was overlooked and not treated as it would be today. I love the stories that lie behind a headstone and endeavour to bring these tales of people who are interned or remembered at Rookwood cemetery in Australia in my capacity as a committee member of the Friends and volunteer tour guide there. The humblest headstone can reveal a tale of a most fascinating person. Yes, there are many stories to be re-discovered–and told. So interesting yet sad. Thanks for sharing their story. Excellent research on a little known piece of history. Sad that we lost two angels, and our country was made better by their works.